GMO’s are becoming more and more prevalent in the United States and without labeling laws, most Americans have no idea they are eating food containing GMO ingredients. Unfortunately the debate goes back and forth whether they are bad for us or not and yes, they are. Asbestos was initially deemed safe until 30 years later when people were dying from it. There has been almost no testing done on GMO consumption and the human body, though in rats and pigs it has proven to cause a myriad of illnesses; cancer, tumors, sterilization, serious intestinal issues, etc. Worse yet, there has been no long-term testing done. Monsanto made 10.5 billion in profits last year in seed sales alone and still no clinical testing. So, to put it bluntly, we are their living guinea pigs. Over Christmas break President Obama and the FDA signed the bill that silently gave the go ahead for consumption of GMO Salmon; the first Genetically Modified animal product approved for human consumption – coming to a store and dinner table near you. 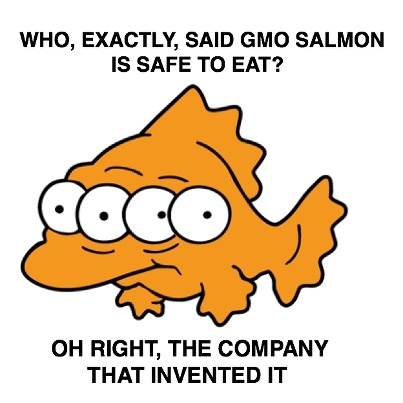 GMO salmon is sterile, grows abnormally, has impaired swimming ability and risks your health & the environment. This fish has: two types of salmon DNA and the DNA of an eel fish, it’s made in a petri dish, grows twice as fast, in half the amount of time, and again, no testing for long-term GMO effects on humans or the possible detrimental effects on our eco-system. No matter what anyone says, this GMO frankenfish will eventually find its way into our rivers and lakes, and then what? Since Congress, President Obama, and the FDA do not think we have the ‘right to know’ what we are eating, this salmon goes completely unlabeled. The peculiarity of the situation is that our fish is already being labeled wild or farmed, so why not GMO as well? The FDA ‘deep pockets’ apparently deems it unnecessary as they do testing and choose instead to force feed it to the American public and roll the dice. This all seems a little fishy to me… no pun intended. If GMO’s were not harmful in any way, why aren’t all those big money companies who buy these ingredients cheap to fill our foods with, standing on the pulpit to defend them? Why did the big companies like Cocoa Cola, Nestle, etc… (see full list here- http://bit.ly/17TGbeL) spend over 40 million dollars to secretly defeat California’s prop 37 which would label foods that have GMO ingredients? And why is Monsanto, the world’s biggest producer of GMO seeds, threatening to sue states like Vermont for wanting to pass their own state labeling laws? We have the right to know. Basically anything that isn’t 100% organic and has any of the ingredients listed below are genetically modified. Don’t you think we have the right to know? GMO is bad people, it really is. The fact that there has been no substantial testing done by this irresponsible company, who make billions in revenue off the possible detriment of fellow Americans by selling cheap food, is sending up HUGE red flags. The food we are eating is making us sick and it’s not going to stop making us sick until we decide to change it. Those with and without medical insurance: Can you afford cancer? Can you afford to be sick? Physically, mentally, emotionally? Can your family? Are you willing to take that chance? The moral of my story is, if companies are skittish about putting GMO labeling on their products for fear of the general public not purchasing them, my gut instinct says they have something to hide. Organic sings loud and proud, so GMO why not follow suit if there is nothing for us to fear. Reblogged this on GlutenFree Gal.